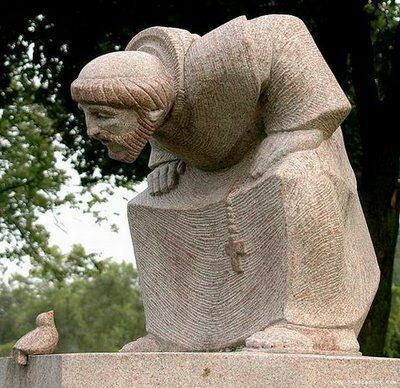 Along with many colleagues and companions in my progressive Christian denomination, I’ve made frequent use of this saying attributed to Francis of Assisi to make a point about the perils of lip service and the Christian imperative to serve the neighbor. It’s not surprising that we find it appealing. Activism for social justice is a vital part of our denomination’s ethos in ways that verbally commending the gospel to others—evangelism—is not. This much-quoted admonition pithily sums up our liberal credo: Talking about faith is less important than demonstrating it. Besides, Francis said it. It doesn’t matter that we don’t normally venerate saints in my denomination. Francis is hip and counter-cultural; we’re pleased to take his word for things, a word that just happens to lend authority and charm to our bias. Lately, however, I’ve been reconsidering the usefulness of this saying. For one thing, it’s doubtful Francis ever said it. No early biographer records it among the hundreds of other sayings and stories, historical and apocryphal, attributed to il poverello. Neither is it found in any of his extant writings, which are few in any case. Of course, the fact that Francis never said it is not in itself sufficient reason to stop using the phrase. Many things that someone never said are still useful. If they reside somewhere in the zip code of the supposed author’s spirit, no harm is done by a dubious attribution. Besides, one can get insufferably pedantic about such things, and more than a bit obsessive. The internet is rife with phony or edited citations from heroes we wish were more like us than they actually were, and to set about correcting them all would be a lifetime’s work of debatable merit. In this case, however, I believe Francis would’ve been puzzled by this saying and by the use we make of it to defend the notion that preaching with words is of secondary importance to a gospel preached with deeds. In the context of his life and ministry, it seems misleading at best, if not plain wrong. Unlike the famous peace prayer also attributed to him, this saying about preaching appears sufficiently distant from his spirit as to make a correction meaningful, and perhaps even necessary. No brother should preach contrary to the form and regulations of the holy Church nor unless he has been permitted by his minister. And the minister should take care not to grant [this permission] to anyone indiscriminately. All the brothers, however, should preach by their deeds. His stance is unsurprising given the role of preaching in his day when the fear of doctrinal heresy mobilized the repressive machinery of church and state to the point where scholars like R. I Moore can speak of a “persecuting society.” Francis’ contemporaries believed, rightly or mistakenly, that heresy was rampant and infectious, and that one of the primary causes for its appearance was weak preaching by Catholic preachers, made even weaker by their scandalous lives. The way to prevent the spread of this contagion and recover the wayward for the true Church was for Catholic preachers to preach better and more zealously, and to conform their lives to their preaching. Preaching with words was at the heart of many of the new evangelical movements of the period. The hierarchy kept careful watch over these movements, ruling some out of bounds because of perceived doctrinal deviance, or because of disciplinary failures, especially the failure to secure proper permission to preach from a lawful ecclesiastical authority. Francis was adamant that he and his brothers should stay in bounds; he insisted on solid doctrine and proper process. 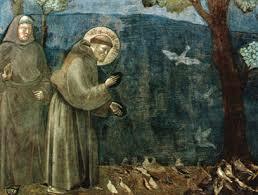 Francis was not merely being canny or self-protective. He was a true son of the Church (which did not preclude acts of what one writer has called not civil, but “ecclesiastical disobedience”), and he was fundamentally concerned with the sequela Christi. To follow the Jesus of the gospels as closely as possible meant not only forgoing possessions as an outward sign of an inward renunciation of power; and not only keeping affectionate company with the last and the least, even the officially segregated leper; it also meant preaching the good news, announcing an urgent message, and doing so with words. 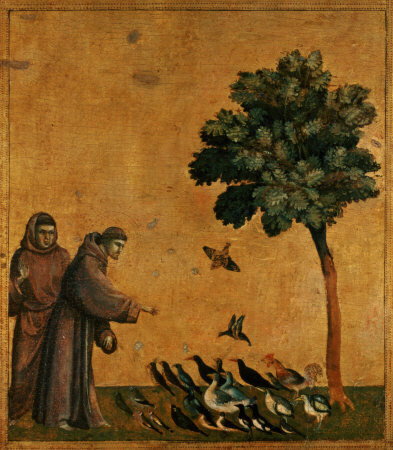 Preaching was the Franciscan charism every bit as much as the devotion to the poor and pastoral care for the sick for which he and his first followers gained such fame and admiration. Francis’ own practice is revealing. His first biographer, Thomas de Celano, describes him as a peripatetic preaching machine, in the mode of a George Whitefield or the early Wesley, sometimes preaching in up to five villages a day, mostly in the open air. In the countryside he perched atop bales of hay in granary doorways; in the cities he shouted from the top step of public buildings. He preached to anyone who would listen, as well as to those who weren’t sure they wanted to—it was reported of him that he would crash rich people’s parties and preach to them. According to legend, he even preached to the birds in the trees, from whom he got a much better reception, and to the Sultan of Egypt, who was not persuaded, but warmed to him and gave him safe passage home. It turns out that he was a fiery sort of preacher, often dancing around or bouncing up and down as he told his listeners “about vices and virtues, punishment and glory…” (Third Rule, 1223, IX). If we were to hear him today, we might find him a bit too blunt for out taste, more like Jonathan Edwards than the sweet proto-hippie Francis of Franco Zeffirelli’s Brother Sun, Sister Moon—or if not like Edwards exactly (for Francis disliked long, elaborate sermons and exhorted the brothers to use words that are “studied and chaste, useful and edifying to the people), then at least like Jesus, who did not hesitate to name names and call people to conversion in order to receive the good news of mercy with an open heart. Francis’ words, de Celano wrote, “were neither hollow nor ridiculous, but filled with the power of the Holy Spirit, penetrating the marrow of the heart, so that listeners were turned to great amazement.” This most joyous of all Christian saints was serious about the power of speech—he respected words; and respect for words is another reason I’ve decided to stop saying that we should use them only “if necessary.” Such a sentiment blithely reinforces, I think, the common sense notion that words are in the end “just words,” ephemeral and useless when measured against the efficacy of deeds. When Barack Obama was campaigning for the presidency in 2008, his detractors mocked him for being eloquent. (Some of his supporters were wary of his speechifying too, to be fair.) The implication was clear—eloquence is a dodge for substance. Words about vision and promises sound good, but they are too easy. In the end, they defraud; realizations matter more. Or so one would think. The late Colombian novelist Gabriel Garcia Marquez recounted a curious incident to a journalist several years ago. It took place during a gubernatorial election in a northern Mexican state where the entrenched ruling party, the PRI, was again on the verge of total victory. Party operatives had bought the attendance of a big crowd of villagers who, eager to earn their pesos, were patiently listening to the customary litany of PRI accomplishments–clean water, new sewers, schools, community centers, more street lights. Rampant graft meant that most of it was badly built, of course, and things broke or closed down with depressing regularity. Nonetheless, the crowd applauded on cue as each achievement was touted; but way at the back of the crowd, a small man raised a big placard on which he’d scrawled what I think is clearly a sarcastic, but also a massively subversive message: “¡Basta ya de realizaciones. Queremos promesas!” Enough already with accomplishments! We want promises! It seems that some accomplishments can’t hold a candle to words; but even more, it seems that people need hope and vision as much if not more than stuff. Even if all that PRI stuff had been well-built, I imagine that the villagers might still want words as well as deeds, especially words that are transparent enough to raise the curtain on a new heaven and a new earth, lifting our eyes to a horizon beyond the everyday so that we can see what is not yet and thereby cultivate endurance and refine our hope. No one disputes the assertion that words can be empty, duplicitous, or just plain vapid, but our experience also teaches that words of truth and substance, words of sincere testimony—even words that “only” promise a future or describe a vision and are not always immediately coupled with deeds—have unimaginable and “necessary” power. It’s instructive that when it comes to the great liberation movements of our time, no one has trouble recognizing the need for and the power of words. Speaking up and speaking out is dangerous business in such moments—and it is necessary. “We begin to die when we do not speak out about the things that matter,” said Dr. King. “Silence = Death,” proclaimed gay liberation protest signs. When it come to verbal expressions of religious faith and testimony of religious experience, however—even though we say we believe that we too have an urgent message of life and liberation—we seem far less sure. 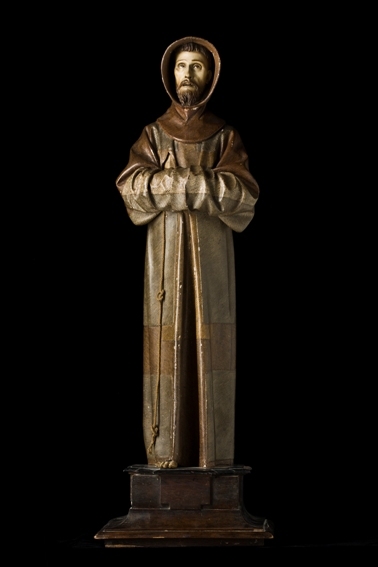 The supposed Franciscan saying about preaching with deeds is almost irresistible, but if it encourages a subtle denigration of the power of speech to testify effectively to truth; if it downplays not only preaching in the narrow sense, but also evangelism, we probably ought to think twice about its usefulness. For a tradition of faith that stems from a Word—indeed, from the Word—and whose ministry to the world is “bold speech” about God (Acts 4:13), it seems at best ill advised to encourage a lack of confidence in or respect for the necessity of verbal testimony. We must indeed, as George Fox always insisted, let our “carriage and life preach,” but because the distinctive meaning of the acts we perform is not always self-evident—because they do not automatically explain themselves nor make immediately apparent the peculiar character of the God who inspires them—we must speak. We’ve been called to a way of life that’s grounded in and defined by the person and work of Jesus Christ whose mission we claim as our own. That mission is in part to offer a clear word to the world, a word that, were we to keep still, would not be heard otherwise. Humbly to commend the message of mercy to others in a spirit of hospitable hope that all might know more fully who we are and what we intend, and that some might come to know the grace we ourselves have known in Christ, is not optional for Christians. As Paul asks, “How will they believe if they have not heard? And how will they hear if there are no preachers?” (Romans 10:14). In progressive Christian circles, I know this is easier said than done. In my own denomination, the Great Commission sits uneasily on many people, clergy and laity alike. When we speak of evangelism, at best it usually means inviting people to church, which is hard enough for us, especially when we’re talking about inviting the so-called “un-churched” and not just stealing other churches’ sheep. When challenged to do more—to share the Christian story with people who don’t know it, or to share our own stories in the light of the gospel—we falter. A colleague tested this assertion at a workshop not long ago. The participants were church people active in their local communities and committed enough to spend a long Saturday at a denominational learning event. They agreed that they were very reluctant evangelists. When asked to say what stood in their way, they noted the cultural baggage attached to the word “evangelism,” fear of offending against pluralism, and worry about being judged or rejected as holy rollers or fundamentalists. They worried that others would find them irksome or boring or judgmental. They did not want to impose their beliefs on others. They worried that they didn’t know enough to be able to “defend” what they might say, and this left them feeling intimidated. They wished they felt stronger in their faith and knowledge of the Bible. They worried that they didn’t have the language to tell the story appropriately, correctly, or compellingly. And several said they felt unsupported in their efforts to share their stories with others. This is not the place to unpack these responses, to offer correctives to some of the assumptions about evangelism, faith, and the Christian story embedded in them, or to offer suggestions of ways to help willing disciples find their testimonial tongues in a fruitful and respectful way. The only point I want to make here is that although it’s a sure bet that every one of those workshop participants was preaching every day with good deeds, the great silence about God that descends when we don’t know how, are afraid, or believe it is somehow wrong and oppressive to speak about the reasons for our deeds, our experience of grace, and our ongoing lives of discipleship, is a silence that necessarily reproaches the Church. We’ve been given a gift to share for the sake of the world. There’s a huge difference between believing that in that gift we have the answer to absolutely everything and that we are the only true way, and the humble practice of letting our gift be known by commending it to others, speaking with freedom, affection, and gratitude of our experience of God in Christ. This sort of respectful, invitational practice is a lot harder than old fashioned proselytism ever was. There’s no doubt that our current pluralistic context makes it hugely challenging (although people engaged in serious interfaith conversation attest that our current context also makes it hugely rewarding), but that doesn’t justify reticence. Withholding the gift is to break faith with the Giver. Some people might chalk this silence up to having nothing to talk about. I’ve heard it said that many ordinary “liberal” Christians in the pews of our churches have never really had a vital experience of the gospel that they can share; they are without knowledge, encounter, or desire, content to show up and do unto others. I often wonder whether this perception is true, or as true generally as we think. Could it be that some people don’t recognize their experience for what it is, believing that religious experience should look and feel a certain way, holy somehow, maybe happening in church and not in the laundry or the factory? Is it because people don’t know how to frame their experience, don’t know whether it’s okay to use ordinary words or think they have to learn the right words before they speak? I wonder too whether the church directly or indirectly silences such speech; whether, for example, the liberal ethos of my denomination, with its loud crowing about being non-creedal and believing whatever you want, effectively quashes significant talk about faith, having inculcated in us all a great fear of offending and skepticism about, even disdain for significant religious experience, affirmation, and conviction? There is much reflection abroad today about a new reformation and the unknown shape of the church to come. In that conversation, helping every disciple learn to preach the gospel with words should be a major item on the visionary agenda. I know much is being done already; some pastors are actively engaging their people in the practice of testimony, with transformative results. More of us need to follow that example. It will not be an overnight project, but a long labor of patient encouragement, conversion, and formation, beginning with those of us who have too happily latched onto the permission this supposed saying of Francis has given us to keep our mouths shut. We should aim for communities of faith whose members are as articulate about the gospel’s vision and promise as they are active in the service of others. Make no mistake, I do not underestimate the power of deeds. It seems silly to have to say so—they are necessary, and on the last day they will be our judge; but deeds always get first billing in my denomination. I want to put in a good word for words. This entry was posted in Saints on April 25, 2013 by sicutlocutusest. My bad, Rosa. Perdoname! Correction made! Good stuff, Luti! As usual, you drive me around the bend with envy. One correction, though: Gabriel Garcia Marquez is Colombian, not Mexican. Carlos Fuentes, maybe? I hope this doesn’t blow your terrific illustration! Yes, he is! My bad. Thanks for the correction! It is Garcia Marquez, despite my misattribution!